Is the Ukulele a Good First Instrument? Lots of parents want to get their child interested in music at an early age. It can be difficult to decide which instrument is best to begin with. For young children, the ukulele is the perfect gift and place to start thanks to its small size. It is relatively easy to learn to play too – it has only 4 strings which makes it easier than the guitar with 6 strings. Why is the Ukulele Ideal for Children? There are different sizes of ukulele available, making it perfect for kids of all ages and sizes. One of the smallest is the soprano at 21 inches long. This is the most common size of ukulele, and the one which produces the typical uke sound. The largest ukulele is the baritone which measures 30 inches from end to end. A baritone sounds more like a classical guitar, with a much deeper tone due to its larger size. It is possible for even an adult to play a soprano ukulele, but older or larger children may prefer to choose a larger model for ease. 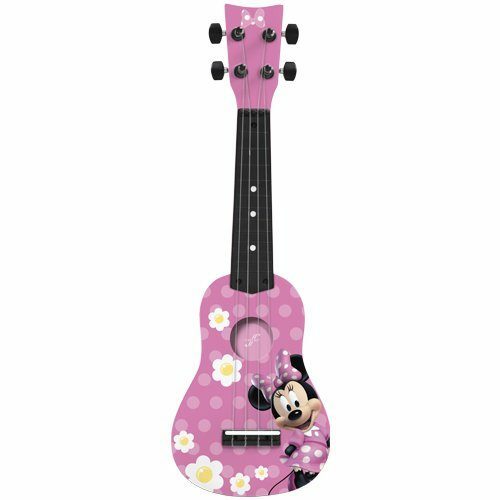 There is a newer size of ukulele known as the sopranissimo, which is 4 inches smaller than the soprano, making it perfect for very young children who want to learn to play. As well as the small size, the easy to use fretboard is another reason why the ukulele is perfect for young children to learn. Each fret is clear to see, and the strings are easy to press down. Unlike a steel-strung guitar, your child won’t get sore fingers from pressing the ukulele softer, nylon strings. A ukulele is a great instrument for adults to learn too, even those who have never played music before. The music is very easy to read, and the instrument is easy to hold and handle, making it perfect for almost everyone. Your child will love to learn along with you, and you can learn to play amazing duets! You can help your child learn how to read the music if you understand it too. Ukulele music is generally written in the form of tablature, which is one of the easiest forms of music to read. These simple charts show each of the 4 strings as lines across the page. The numbers on each line represent the fret, so it’s easy to see exactly where to put your fingers. Chords are very easy to play on the ukulele too, even for young children. Many chords can be played using just one or two fingers, making it easy for children to remember them. This means your child can quickly learn their favorite song – many songs only use 3 or 4 chords – and they will be able to sing along in no time! What Other Instruments are Good for Kids? There are a few other instruments which are popular choices for young children starting out with music. Drums are another great place to start – there are basic models available for children as young as 1 or 2 years old. There are also electronic drum pads which are great for kids aged around 5 and above. These are a great place to start for kids who want to really learn to play well. A small violin can also be a great place to start for young children wishing to learn a musical instrument. Like the ukulele, violins come in a range of sizes, meaning it’s possible to find one to suit children of any age. If string instruments don’t interest your child, the piano is another excellent choice. They can be large and expensive, so an electric keyboard is also a great place to start. It’s easy to learn a simple tune on the piano, so your child will remain motivated to learn.